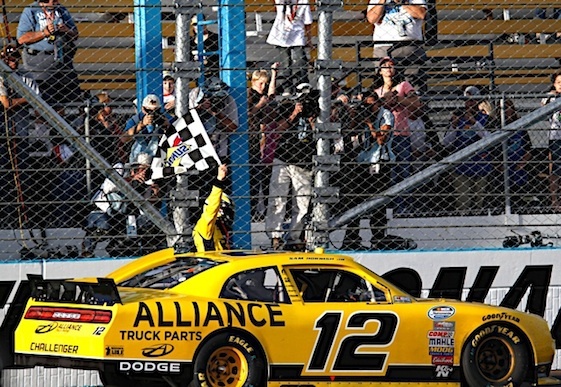 Sam Hornish Jr., a three-time IndyCar Series champion, won his first NASCAR race on Saturday. The victory for Hornish, who has also won the Indianapolis 500, came in the Nationwide Series race at Phoenix International Raceway. Finishing second was Hornish’s teammate at Penske Racing, Brad Keselowski. The battle for the NNS championship was all but decided in Saturday’s penultimate race as points leader Ricky Stenhouse Jr. finished fifth while the only driver capable of depriving him of the championship, Elliott Sadler, crashed late in the race. The crash occurred near Turn 3 when a tap from Jason Leffler’s Chevrolet spun Sadler. Salder slammed into the wall, collecting Aric Almirola in the process. Morgan Shepherd’s Chevrolet came in late and smashed hard into Leffler. Leffler accepted responsibility for the wreck. Stenhouse, driving for Roush Fenway Racing, heads to Homestead-Miami Speedway for the season finale 42 points ahead of Sadler. Sadler started the race 17 points behind Stenhouse. Carl Edwards, Stenhouse’s teammate, finished third Saturday.